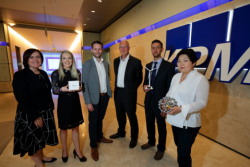 18 of the UK’s most exciting high-tech, high growth potential start-ups showcased to big name corporates including EDF Energy, Rolls-Royce and Samsung for the chance to have their product adopted by the business giants at KPMG in Canary Wharf last week (25 May). The event, the Open Innovation Showcase, was organised by SETsquared, the global number one university business incubation programme run by a partnership of the universities of Bath, Bristol, Exeter, Southampton and Surrey. The aim of the programme is to develop mutually beneficial partnerships or investment deals with the corporates discovering new technologies and products, while the start-ups get the chance to seal deals with business giants that they would never normally be able to access. With angel and venture capitalists also attending, the entrepreneurs had the chance to raise investment too. As well as exhibiting, the start-ups also had the chance to pitch for five minutes each, to over 200 registered delegates, to explain how their technology will impact the market and change people’s lives. All are looking for investment, corporate partners and connections to accelerate the growth of their business. The results also provide a boost for the economy as big corporates get value straight out of university research bases and the tech community, allowing entrepreneurs to bring products and technologies to market faster. 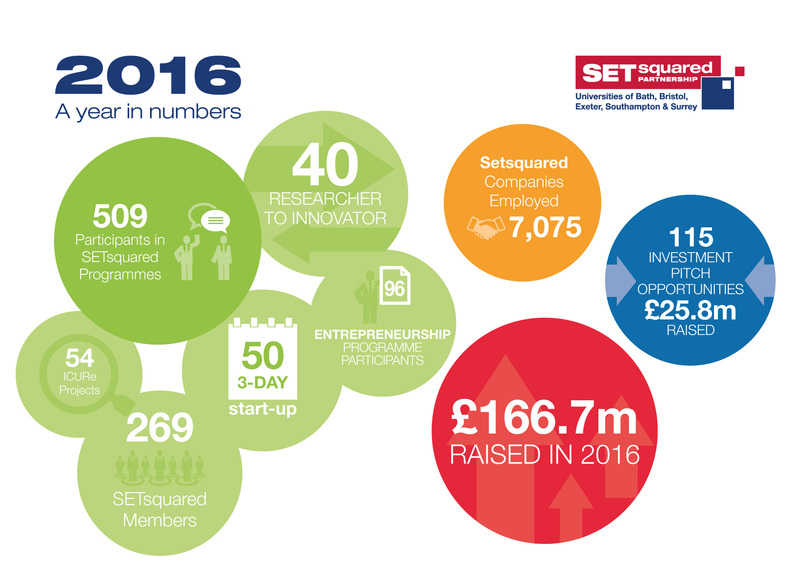 During the event Simon Bond, Innovation Director at SETsquared, announced that the incubator’s start-ups had raised a total of £166m in investment during 2016, greatly surpassing 2015’s record of £90m. Simon Bond said: “Each year the entrepreneurial talent we see at the Open Innovation Showcase raises the standards. We’re seeing more and more investment successes for our start-ups as a result of attending investment programmes like this, and by bringing the very best new companies together from across the South we’re set to see that happen once again. Over the last 15 years SETsquared has helped more than 1,000 businesses raise over £1bn in investment, as well as contributing over £3.8bn in GVA (Gross Value Added) to the UK economy with £8.6bn GVA estimated over the next 10 years – figures that have contributed to it being named by UBI Gobal as the top university business incubator in the world.